★This Homfa Bathroom Cabinet combines style and functionality to create a modern home furnishing ideal for use in bathroom, kitchen, bedroom or any other space to store items, with pure white color, elegant and simple appearance, this wall cabinet will well match with your furniture in your home. √ GOOD QUALITY: Made of high grade moisture-resistant and durable MDF engineered wood, healthy and environmental friendly. √ MULTIPURPOSE CABINET: The cabinet combined with modern style and ample storage space for bedroom, bathroom, kitchen and other occasions. √ EASY INSTALLATION CLEANING: This storage unit is easy to assemble with the detailed instructions, also with the smooth surface, easy to maintain and keep clean. √ ENOUGH STORAGE SPACE: The cabinet has two enclosed shelves and one open shelf that provide spacious storage for towels, cups, soap, tissues and other decorative items. The open and closed door shelving provide plenty of functionality for you. Dear customer, before your purchase, please take this into account: this cabinet is not fit for a pedestal sink and please check if the dimensions of the cabinet meets your needs. Please pay attention to the dimensions information in the second picture and the descriptions, make the measurement to find if the dimensions of the cabinet fit for your home. Thank you for your interests in our product. ✿GOOD MATERIAL: Made from MDF board and chipboard, this sturdy storage will help keep your bathroom tidy and organized., with silver metal handle knobs make it easy to open and close. 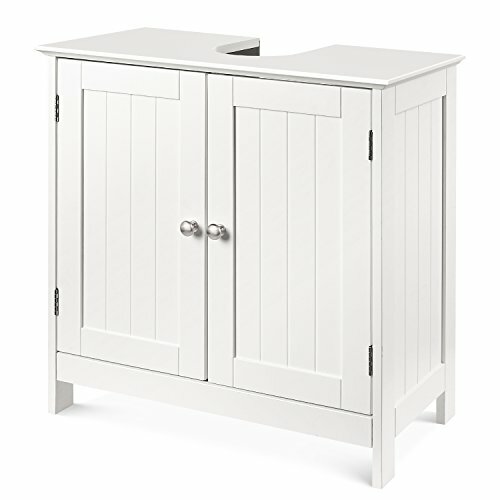 Comes with pure white finish, this storage cabinet is stable, durable, non-toxic and looks elegant. ✿MULTIPURPOSE CABINET: The cabinet combined with modern style and ample storage space for bedroom, bathroom, kitchen and other occasions. Features enclosed shelf with double shutter doors, and two tier shelf to place towels, soap, tissues and other decorative items. ✿SPACE SAVING:The back of the cabinet have a opening space, which make the cabinet can be assembled under the sink or beside the sink, so this cabinet very space-saving, and provides extra storage without taking up valuable floor space. ✿EASY TO INSTALL AND CLEAN: This bathroom cabinet is easy to assemble and all mounting hardware is included. And the cabinet surface is smooth, making this cabinet very easy to clean with cleaning cloth.